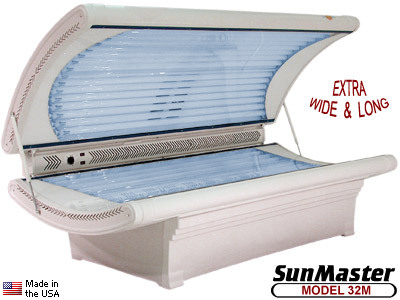 Each SunMaster M Series bed has a full body cooler that blows a gentle breeze over your clients while they tan, with an ON/OFF switch for the fan. Your tanning bed comes with a built in timer and ON/OFF switch. The built in timer is defeated when you use the remote timer port and connect to an external timer (not included). Every SunMaster tanning bed uses our exclusive textured reflector system. Laboratory testing proves that this "dimpled" style reflector diffuses the light better, and provides a more even tan. No striping or hot spots. It is just part of the reason that SunMaster tanning beds outperform other tanning beds in their price range. A tanning bed is only as good as its tanning lamps. While lesser systems will use off-the-shelf lamps, we would never put a generic lamp in a SunMaster. We design and set the specifications for every single tanning lamp we use. SunMaster was making lamps before we made beds, and no one has dedicated more effort in producing better quality tanning lamps. This is why we are quickly becoming the #1 replacement lamp in America. Your SunMaster tanning bed is perfectly balanced with SunMaster Custom Series tanning lamps, for maximum performance. SunMaster tanning beds never require "buck/boost transformers" or lamp starters. Our electronics were designed in America, for American electrical current. They are patented and deliver more power to the lamp. They are also the most energy efficient electronics on the market, and generate only a few watts of waste heat each. Many salons report that they can add extra SunMaster tanning beds, without having to add extra air conditioning. Expect 50% to 80% LESS heat than old fashioned choke style tanning beds. Direct warranty claim service: We build and back them. Custom Bronzer lamps give deep, rich, sun-like tans. Remote timer port and hour meter are standard. Timer: Analog, built into full body fan. SunMaster has been in the tanning lamp and tanning bed business since 1985. We understand your needs and feel confident we can deliver more tanning bed, for less money. We sell direct, with no dealer network, so you don't pay extra markup. We support our tanning beds directly, so if you have a problem down the road, you can speak to the same people who BUILT your tanning bed. Better technology, better quality, better performance. SunMaster IS the tanning technology leader.